In Go West, Jeremy Sparks shows that God can use anyone to move His work along who is willing to Get Out, Witness, Encourage, Serve, and Testify. Sparks listened to the call of the Lord and learned about not only serving in His Kingdom, but about himself and his personal path to God as well. In this companion study guide, Sparks paves the way for you to find that knowledge for yourself. Each of five sections walks you through a week of exploring two of the principles from Go West that guided Sparks on his cowboy journey. Each includes stories from Sparks's life and career, scriptures, personal challenges, and reflection questions with space to write thoughts and prayers. 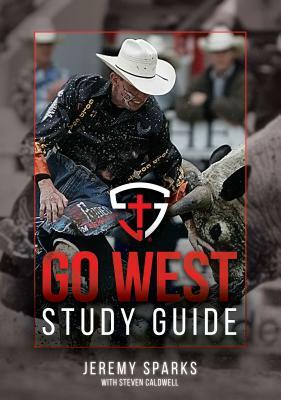 Use this guide to help you take your first steps toward a different life in the service of God - to cowboy up and Go West. Soon after accepting Jesus Christ into his life, Jeremy Sparks received a specific vision from God. At 14, God called Jeremy to be a rodeo bullfighter. He went on to become a professional bullfighter and was later enshrined in the Cheyenne Frontier Days Rodeo Hall of Fame. Jeremy earned his MBA, and served his country as an officer in the Air Force, where he was endorsed by the Pentagon as the -only professional bullfighter in the history of the USAF.- Jeremy and wife, Jamie, live in Fayetteville, Arkansas with their beautiful twin boys.